Zahspeed continued his excellent rise through the middle-distance ranks with a third victory in a row at Sandown on Saturday. The son of Speed N Power has won at 1600m, 2000m and 1800m in his past three starts for trainer Danny O'Brien all with jockey Glen Boss on board. "He is in a great zone at the moment and the way he sits on the pace at a solid tempo and quickens makes it's very hard for him to be run down," Boss said. "He had a few things against him today - dropping back 200m, carrying the 59.5kg and the other leader in the race - but he did a terrific job and it's a credit to Danny and his team that he is in such great shape and form." The win is the gelding's sixth from 18 starts and has taken his prizemoney past $170,000. O'Brien said he would continue running the progressive type through his classes. 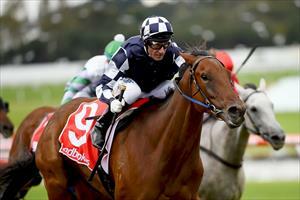 "He is in super form and we will try to continue his winning ways around 2000m at his next start."